This how-to book examines many aspects of Tesla coil creation, dealing with both fundamental design parameters as well as physical construction. 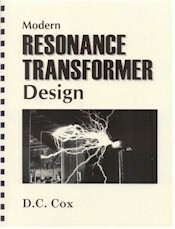 It is intended to give the experienced builder a complete reference handbook for the design of high power resonance transformers. Included are 34 graphic illustrations and all of the equations necessary to calculate every design aspect of the classic Tesla oscillator. Particular attention is given to clarifying the complex interrelationship between various circuit elements.